Basket Of Gold (Alyssum saxatile): growing, planting, caring. Alyssum saxatile is a very hardy perennial requiring little maintenance, and blooms between May and June. It is perfect for rock gardens. 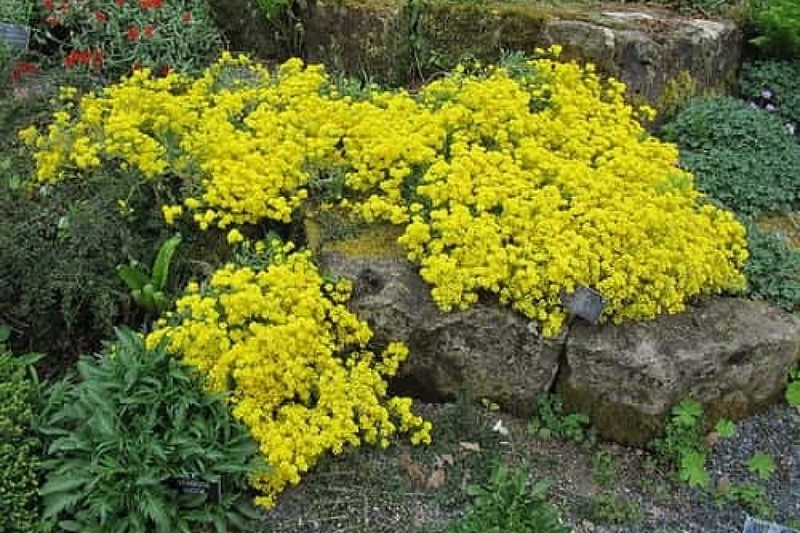 Alyssum saxatile is a small, rounded, evergreen perennial growing from 4 to 12in high and forming a mound up to 16-20in across, with the type species bearing flowers a clear yellow, but cultivars produce flowers in white, cream, lemon, peach or gold. As a native to rocky, mountainous places, it is ideal for a rock garden or for edging garden beds, provided the drainage is sufficient. It can also be grown in a pot, or at the edges of larger pots containing bigger plants. Many cultivars are on the market, including 'Citrina', with paler yellow blooms than the type species, 'Dudley Neville' with golden yellow flowers and 'Variegata' with cream-margined leaves. Preferably, plant in the fall. The basket of gold appreciates a mineral environment and a good drainage: it finds its place in a wall of dry stones. It is important to highlight its lining and falling appearance. A limestone land does not present a problem. Prepare the soil by digging (to decompact without necessarily turning it, with a pitchfork), a scratching and a raking. Add an amendment, if the soil is not very rich. Plant the perennials with a spacing of 20 cm between plants. Thoroughly tamp the soilto not let air in contact with the roots, then water abundantly. Plant resistant to a long period of drought, the watering of the basket of gold will be only very occasional, once the plant well installed in the ground. In pots, water moderately but allow the substrate to dry well before watering again. Unless otherwise specified, do not wet the foliage: the plants "drink" by their roots. Seedlings should be watered gently. Keep them permanently moist to get germination. Prune short after flowering to obtain a compact habit. Once a year, preferably at the beginning of winter, bring to the base of your baskets of gold an organic amendment like compost not completely decomposed. The basket of gold has a limited life - about 5 or 6 years. Think of multiplying it! The seeds of the basket of gold are ripe very quickly after flowering, then cut the short flower stems and keep them in a paper bag. The seeds will fall to the bottom of the bag after a few weeks. Sow in a pot under a winter frame in autumn. You can also let some seeds spread naturally, or if the winter promises to be rough, shelter some seedlings. Mulching the perennial plants will save you from watering and weeding. A mineral mulch is fine for Aurinia, but wood chips will also do. Beware of aphids. Treat preferably with ladybug larvae.